Jalandhar: The closing ceremony of the two-day annual sports meet of Lovely Professional University was held under great celebrations and honours. LPU Chancellor Mr Ashok Mittal graced the occasion as Chief Guest, and awarded the glittering championship trophy to the school of physical education for illustrious attainments of its athletes. 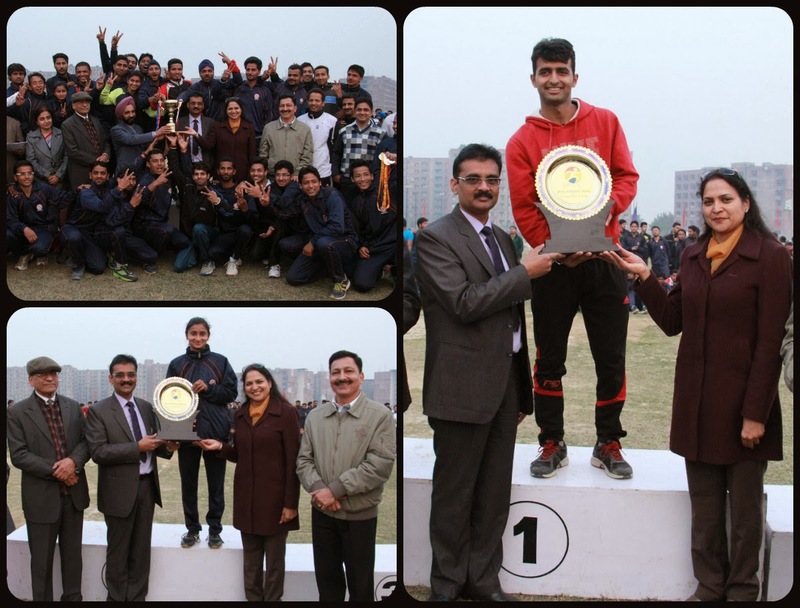 School of mechanical engineering was declared overall championship runner-up; whereas, school of electronics & electrical engineering became overall athletics runner-up. On the basis of establishing 2 new meet records (100 & 200 mtrs), and equaling 15 points with 3 other girl-athletes, Sarvjit Kaur of physical education was adjudged best woman athlete. Sandeep Kumar of electronics & electrical engineering was declared the best man-athlete of the university. In addition, other first three position holders in 17 competitive events were honoured with gold, silver and bronze medals. Congratulating the sports men & women of the university, Chancellor Mr Mittal asked them to keep on imbibing the true sportsman spirit to the core to excel upon their present performances displayed. For different competitive events held on the concluding day, Pinky and Promila of physical education won gold & silver medals respectively for 5000 mtr race with 26:50 & 26:53 minutes; whereas a Chinese student Guo Xiao Xiao won bronze with 29:02 minutes. In 400 mtr race (men), Naveen of Hotel Management declared first with 56:26 sec; Aneet of Phy Edu second with 57:10 sec; and, Lakhan Singh of ECE third with 57:53 sec. For women, Pinky, Sukhdeep Kaur & Veerpal Kaur won gold, silver & bronze medals with 1:18, 1:21, 1:22 minutes respectively. For Hammer Throw (Men) Navdeep Singh (Hotel Mgmt, 24.82 mtr) won gold; Sukhpal (22.48 mtr) and Paramjit Singh (21.86 mtr) both of Physical Education won silver and bronze medals. For women, Navreet Kaur of Education (15.08 mtr), Garima Sharma of CSE (14.78 mts) and Pardeep kaur of Distance Education (14.64 mtr) remained at first, second & third positions. For High Jump (Men) Basuki Nath (Mech Engg, 1.60 mtr) won gold; Avisa of Phy Edu, Ajay of ECE & Sudhir of ECE all with 1.55 mtr got tied for silver. For women, Amandeep of Phy Edu (1.30 mtr), Meena of CSE (1.15 mts) and Mafia of Education (1.12 mtr) remained first, second & third respectively. For 4x400 Relay (Men) team of Lakhan, Sandeep, Sarvesh & Naveen of ECE set new meet record with 3:52 minutes and got gold medals. Team from Phy Edu took 3:59 minutes for silver medal and again bronze medal too was won by another team of Phy Edu. In women category, team of Sarvjit Kaur, Pinky, Harvinder & Balvir Kaur of Phy Edu set a new meet record with 5:02 minutes to claim first position. Another two teams from Phy Edu took 6:02 & 6:50 minutes for second and third positions as well. For Javelin Throw (Men), Sukhjinder Singh of Dist Edu claimed gold medal with 46.58 mtr; Vikram Singh of Mech Engg silver with 45.82 mtr and Jagdeep Singh of Dist Edu bronze medal with 41.61 mtr. For women, Nirmal Kaur of School of Business got gold with16.36 mts and girls of physical education Satwinder Kaur (16.32 mtr) & Arti Abrol (14.82mtr) got silver and bronze medals. In 200 mtr race (men), Sandeep & Lakhan of ECE took 24:60 & 26:25 secs and claimed gold and silver medals respectively. Md. Yunus of Civil Engg claimed bronze with 27 sec. For women, Sarvjit & Madhvi of Phy Edu took 29:60 & 32:60 secs to claim gold and silver medals respectively. Jyoti Mehta of Computer Applications claimed bronze with 37:03 sec. In 100 mtr race (men), V D Pawan Kumar of ME took 12:01 and claimed gold medal. Sandeep (12:16 sec) & Akshay (12:48) both of ECE clinched silver and bronze medals. For women, Sarvjit & Madhvi of Phy Edu took 14:12 & 15:40 secs to claim gold and silver medals respectively. Priyanka of School of Business claimed bronze with 16:44 sec. The nursing statement of purpose is one of the best way to write statement about particular topic. nice and informative posted reading your blog.Enjoyed reading your blog.heres a useful blog on nursing statement of purpose.Have a look. By default windows 10 has normal fonts but you can install fonts in windows 10 for making your documents more attractive. You can download fonts from many sites.